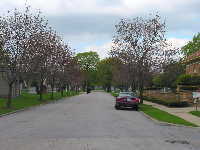 Kate was buried on April 12, 2004, in the Rostenkowski family plot at St. Adalbert's Catholic Cemetery in a suburb on the northwest side of Chicago. Her grandfather Albert andmembers of his family are buried there. As a little girl, Kate used to go there when her parents visited Albert's grave. She used to climb on the monuments, thinking it was a park. 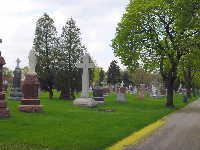 For those who wish to visit Kate's grave, St. Adalbert's is at 6800 N. Milwaukee Avenue, Niles, IL. On the map of nearby area, a blue dot indicates Kate's gravesite. 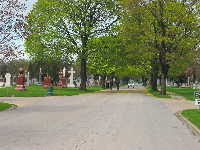 After entering through the main gate on Milwaukee Avenue, you will see the cemetery office on the right. 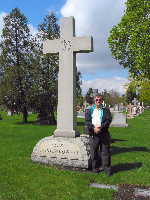 After the next small cross-street, you will see a 12-foot-high cross on the left, which marks the Rostenkowski plot. The pictures below also serve as a guide. 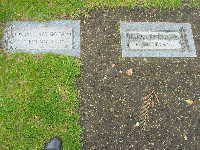 Kate is buried to the right of her father Edward, and vertically above her mother Lillian. In the pictures below, the fresh excavation for Kate's grave can be seen. 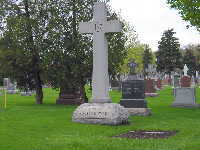 It takes a few months for the cemetery to install new markers, and Lillian's was eventually replaced with a tandem marker with both her and Kate's information. 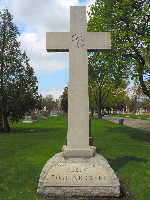 Although there are about a dozen Rostenkowski-family graves in front of the cross, only a few of them have individual markers. When you visit the cemetery, you may see flowers at the grave of Emmett McMorrow, also on the Rostenkowski plot. He was the husband of Mary Ann McMorrow, another of Albert's granddaughters and former chief justice of the Illinois state supreme court. Very devoted, she has visited Emmett's grave every week since he died 20 years or so ago. You might even bump into her, as Kate and John did on occasion when visiting Kate's parents' graves. If you wish to leave flowers, note that the cemetery has some regulations. Natural and artifical flowers are allowed, but container sizes are limited: pots 6-8"; boxes not exceeding 18"L x 6"H x 8"W; and placed on the marker and not dug into the turf. Also, the flower shops across the street know what's OK. Finally, if you do get an opportunity to visit, please let us know how it goes. Thanks!